Monsters can scare us, make us feel weak and helpless, make us sympathetic to their tragic story and even cheer us up. This makes defining a monster a difficult task. A creature of the night, like a vampire, can now be seen as both good, like in the recent Twilight series, and evil with the classic Dracula tales. There are so many ways to interpret a monster that the meaning is often lost. With Gareth Edwards’ Godzilla, these creatures cease to be legends and myths and become true nightmares. It's this fear and intrigue that has kept us watching Godzilla on the big screen for 60 years. Monsters are abominations of life. These are things that should not exist, yet, at least in the realm of fiction, find a way to crawl into our fears and terrify us. Perhaps they scare audiences because monsters defy all the laws of logic, nature and reality, and are still alive. In Godzilla, the monster is said to be more ancient than any recorded creature and is nature's way of restoring balance to the world: the ultimate equalizer who will rid the earth of any major threat. This could even mean mankind, if Godzilla wanted to. Godzilla stands taller than most skyscrapers, was made stronger by atomic bombs, can unleash that same atomic fire out of his maw, and is practically indestructible. Hydrogen bombs were used to combat Godzilla in 1954, but he merely shrugged off the blast. In this new blockbuster, he walks right through the heavily armed American military, swatting their missiles and battleships away like flies. We are dealing with something that we can never hope to comprehend or combat. Defense forces have tried for years to bring Godzilla down but have always failed. He is a creature that belongs among the gods, which is even mentioned in the newest movie. What makes Godzilla all the more interesting, and somewhat scary, is that we created him. It was through our continued use of atomic bombs and a failure to understand their true power that we got Godzilla. In some ways, Godzilla shows us how powerful nuclear energy and weapons can be. In other ways, he is the ultimate screw-up and lets us know that we’re not as strong as we think — that we don’t have all the answers and that some threats are beyond us. But all the while, Godzilla does not care about what happens to us. He walks through battalions of soldiers and squashes them like ants. In the 1954 Godzilla, he rampages through a war-torn Tokyo and sets it ablaze, leaving nothing but a massive hole in the ground. In the Japanese films, Godzilla was more than just an allegory for the atomic bomb, but a living one. 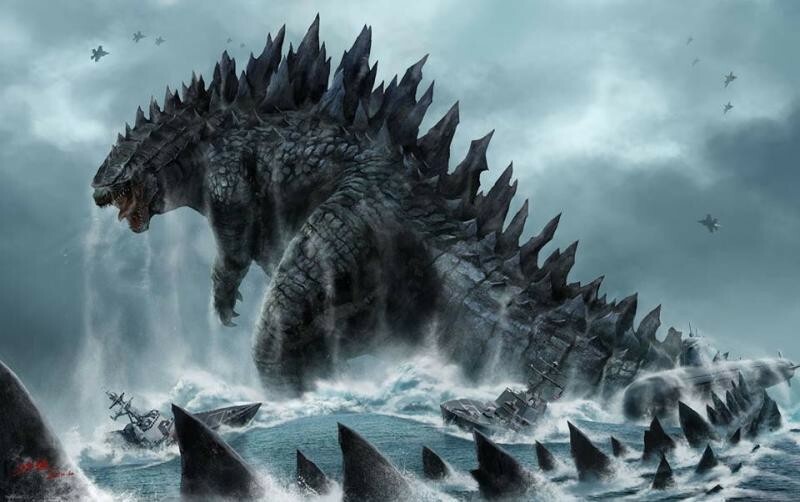 Godzilla behaved exactly like a nuclear weapon: cold, uncaring, designed specifically to kill in the most effective manner, attacks without any warning, leaves a huge cloud of destruction and is unstoppable. Over time, these themes and messages changed. Yet Godzilla survived and became a pop culture icon. The reason for this can be attributed to his many films staying loyal to how intimidating and powerful the creature can be. Whether Godzilla was ripping apart Tokyo with his bare hands or fighting three-headed space dragons, he has remained strong and terrifying. This latest take on Godzilla remains true to this notion. The monster towers over the San Francisco skyline, pushes aside aircraft carriers like they were bath toys and creates tsunamis just by stepping out of the ocean. The difference with this film is that Godzilla is portrayed more as a disaster, like a tornado or hurricane, instead of an atomic bomb. It is clearly more powerful than us, able to rip our cities apart, but we learn to survive and grow stronger because of it. As such, Godzilla is one of the most horrific monsters and differs greatly from his predecessors. He is more than just an abomination of life, but a sign of the both the achievements and failures of mankind. What’s new at Volume 2014?